We’ll Rock Your Next Party or Event! Jumpin’. Thumpin. Adrenaline pumpin’ 60s to 90s Rock-n-Roll. That’s Daddy’s Gotta Girlfriend, the good-time band that gets you out of your seat, onto the dance floor and into the kind of full-on rock-n-roll buzz you knew as a teenager. 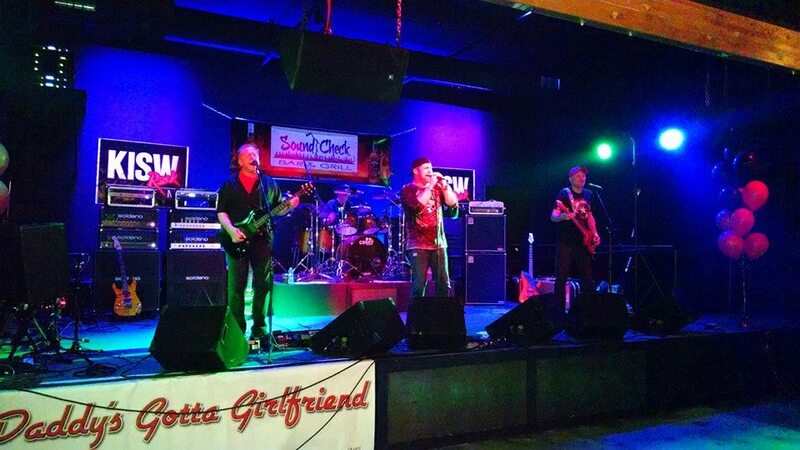 Everything from Judas Priest to The Go-Gos will be on the play list when you hear this North Seattle-based band that has earned fans around the Puget Sound. Make no mistake. This is no basement band with illusions of grandeur. These are consummate professionals who have mastered their instruments, perfected their sound and are serious about one thing: having fun! Fronted by powerhouse vocalist Tom Judge, Daddy’s Gotta Girlfriend brings the heat with red-hot guitar and bass by Steven Heinz and Ronald Ekdahl. The backbone behind the mayhem is drummer Leo Ekdahl. Together this combo puts on an uncompromising, straight-ahead rock-n-roll show that will keep you dancing on all night long. Make your next date with Daddy’s Gotta’ Girlfriend!